View cart “The Eight Keys to a Happy Marriage” has been added to your cart. Anger Management for the Twenty-First Century eBook is a hands-on workbook that makes you more aware of your behavior and options, so you can defuse situations that would otherwise quickly escalate and turn ugly often, with tragic results. We are proud to offer this ebook, by Tony Fiore, Ph.D. and Ari Novick, Ph.D. 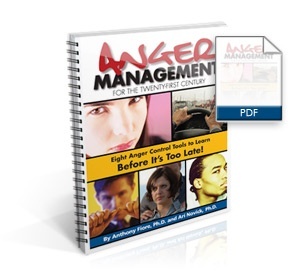 This is an excellent resource for learning how to manage and control issues relating to the emotion of anger. The book includes numerous lessons and helpful tools and information on topics such as stress management, empathy, assertive communication, forgiveness, expectation management, self-talk, judgment and impulse control management, and much more. Anger Management for the Twenty-First Century is also for designed or for individual therapists who use a structured approach to therapy and need a week-by-week guide with homework assignments for their clients. This is a perfect book to use as a self help manual for individuals, couples, and families as well as mental health professionals, businesses, clergy, probation departments and law enforcement personnel.